This week I've been busy working on my Beading Babes project. The reveal date has been moved back a couple weeks, however, I promised it to someone for the 2nd so I'm planning on getting it done by then. The project I selected is Josephine's collar. I really like how this is working up so far! See how pretty this is with all the different colors?! If you haven't checked it out yet - I urge you to do so!!! You won't be sorry to have this tutorial in your arsenal! 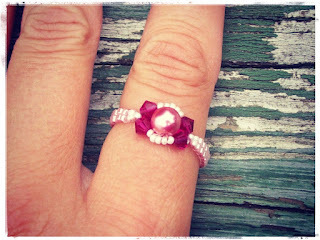 Speaking of tutorials - I quickly worked up a tutorial for the ring I created over the weekend. It's nothing fancy - hand drawn and photographs - so don't get too excited. But it is free! If you are already experienced in right-angle-weave, this ring should take you about 15 minutes to complete. It's THAT easy! And if you are a beginner, like my friend was over the weekend, it shouldn't take much longer than 30-45 minutes. Yes, it's THAT easy! 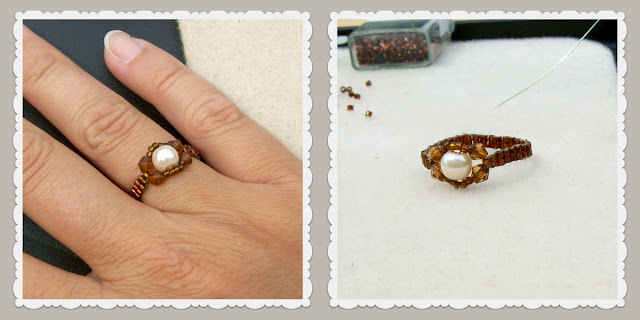 I'm calling it the Pearl Bezel Ring. Click on either of the pictures, or here, for a link to the tutorial. But wait - there's MORE! Bead & Button recently announced their theme for next year's Bead-It-Forward quilt project. It's "Flowers: Stitching to find a bloomin' cure". Love it. All the details are on their site here. The deadline is March 1, 2013, so there's a little over 6 months to start working on your squares. So my goal is to once again, create at least one square for every survivor I know. But also to create at least one pattern every week, and post it here on Fridays. The patterns will also be on my free patterns page. So here is a peyote pattern, measuring 1.5x1.5inches, (two drop, so it should work up rather quickly! 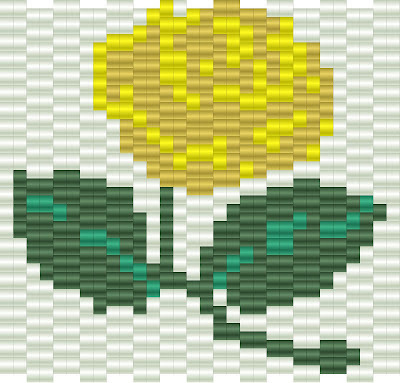 ), free for anyone to use for the Bead-it-Forward quilt project! Love the bright colors for the bracelet and earrings they are so pretty. Thank you for sharing the patterns. The gifts for your stepdaughter are stunning!! Love them!!! I haven't picked up a Bead & Button magazine in years. Beautiful & Happy Looking complete set:-)It's so Lovely for Summer.I also like those pearl rings of Yours.They seem to be so simple,but elegant.Very nice design for the small rings. The rose pattern is worth making.Seems Lovely and easy to make in lots of color versions. Thank you so much for the beautiful earl ring tutorial! It is so going to be made many times over!!! Thanks again!